This picture is from the first time I went for a regular tour. I didn't take any pictures when I went on the ghost tour. Halloween is upon us. It is my favorite time of year. Growing up I always loved everything and anything scary. Naturally, I became a writer. I like to incorporate a little ghostly presence in most of my mystery novels because the unknown element is one that is frightening to me. One of the questions I am asked the most is do I believe in ghosts. I normally tell people I am an open minded skeptic. What I mean by that is I don’t necessarily believe, but I am willing to accept there are a lot of things in this world I cannot explain. However, when I travel I try to stay in haunted locations and there is nothing I love more than a good ghost tour. In fact, the Ninth Floor was inspired by one particular ghost tour I went on. But that isn’t the story I am going to tell you today. Recently I went on a ghost tour of the Missouri State Penitentiary, once known as the bloodiest 47 acres. It is infamous for the inmates it held, the violence contained within its walls, and the more recently for the ghostly sightings. 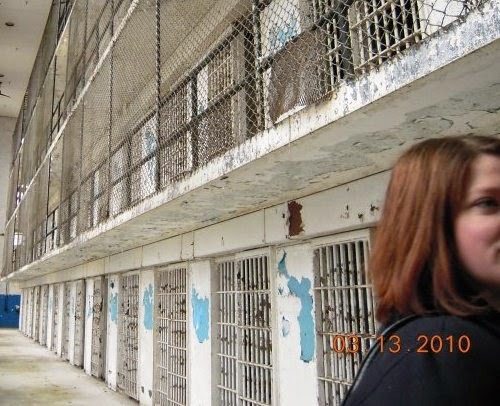 Syfy’s Ghost Hunter, Travel Channel’s Ghost Adventurers, and I am sure many more have all done investigations of this former penitentiary to the same result—it’s haunted. The tour started at 9:00 p.m. I arrived with my friend and the tour started. At first it seemed there were too many people to really get the full effect of the creepy, deserted prison at night atmosphere. I had been on the history tour before and the ghost tour was just as good. Both times I have been there the group was guided by a former prison guard who actually worked within the walls. The stories they shared of what it was like inside are riveting. I didn’t see or hear anything noteworthy in the first half of the tour. It wasn’t until we headed to the oldest building and were taken down to “the hole”. We were directed to enter one of the cells. The first cell I went into was too crowded so I moved to the next. It wasn’t crowded, only one other person, but it also didn’t feel creepy and that was what I was looking for. I went down the narrow hallway to the other row of cell door and entered the first one. Immediately it felt different than the others. I didn’t let that bother me—that was what I paid for. The tour guide flipped off the lights so we could experience solitary confinement. Immediately the room felt massive, though I knew it was compact. It was disorienting so the first noise I heard I dismissed as an overactive imagination. It was something like a growl that came from my right hand side behind me. I shook off any fear and continued to allow the experience to build. Next I heard what sounded like a yowl. The best and most accurate way I can describe it is it sounded like a person pretending to be an angry cat. It was quite loud and real sounding. It happened two times and the tour guide asked who made that noise. No one answered. He repeated the question and still no one confessed. He turned the lights back on and we all came out. He asked us again and this is where things get weird. The first cell I went in, the most crowded one, didn’t hear anything. The cell next to me that only had two people in it, also didn’t hear anything. It turned out only three of us heard the sound at all: the tour guide, the man in the cell facing me, and me. It sounded to me like it came from my left hand side, but while the two women in the cell to my left were frightened they didn’t hear anything. I can’t say whether or not it was a ghost, but I will say it was one of the strangest experiences I have ever had.